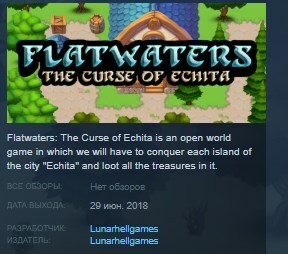 Flatwaters: The Curse of Echita is an open world game in which we will have to conquer each island of the city "Echita" and loot all the treasures in it. The unstoppable captain of the red beard, very skilled with the pistol but also extremely short-tempered, wants to conquer the islands of Echita, a small city composed of about ten islands, as he became aware of the presence of treasures. Enemies and strange creatures who will do anything to kill you. An arsenal of weapons for the ship to spread chaos. Different skills for the Red Beard Captain. Treasures scattered around the city.